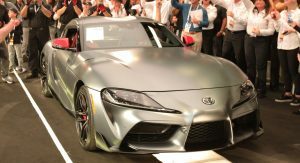 If you found the $500,000 gouging asking price for the used 1994 Supra insane, what would you say about the first production 2020 Toyota GR Supra and one-of-one special that just pulled in $2.1 million? 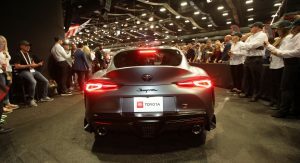 Before venting, you may take some comfort knowing that all proceeds from the sale that went down at the 48th Annual Barrett-Jackson Auction at WestWorld of Scottsdale will go to support the American Heart Association (AHA) and the Bob Woodruff Foundation (BWF) that helps veterans and service members. 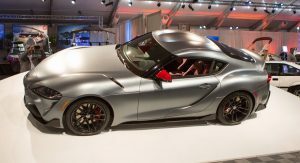 The car, nicknamed “Global #1”, is said to be “unlike” any other 2020 Toyota Supra build in the world. 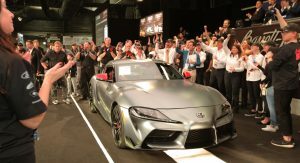 However, in practice, the only Supra with a VIN that ends in 20201 is based on the first launch edition model made for the U.S. market, adding unique coloring to the blend. 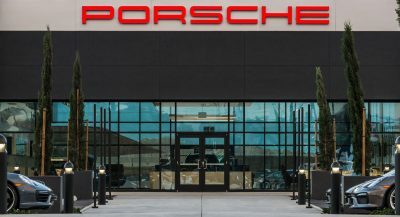 Specifically, the exterior is factory-finished in a matte gray paint called “Phantom Matte”, with gloss red mirror caps and matte black wheels completing the look. Inside, it has a red interior and carbon-fiber inserts. And well, that’s about it. The only standout feature here is the exterior paintjob, as everything else is included in the regular Launch Editions. The unidentified winner of the auction also received a custom racing suit and two VIP passes to this April’s Toyota Owners 400 NASCAR race in Richmond, Virginia, along with the opportunity to drive the pace car and do hot laps with NASCAR driver Michael Waltrip. 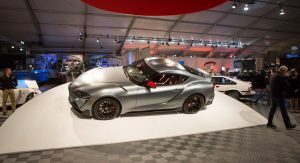 If the matte-grey exterior finish and bragging rights of owning VIN #20201 were of no interest to you, then the 2020 Toyota GR Supra Launch Edition, of which 1,500 examples are destined for the USA will do just fine. Priced from $55,250 before taxes and the inevitable…dealer markups, the Launch Edition will be available in three exterior colors, Absolute Zero White, Nocturnal Black or Renaissance Red 2.0, with the first two coming with red interiors and the latter in black leather. 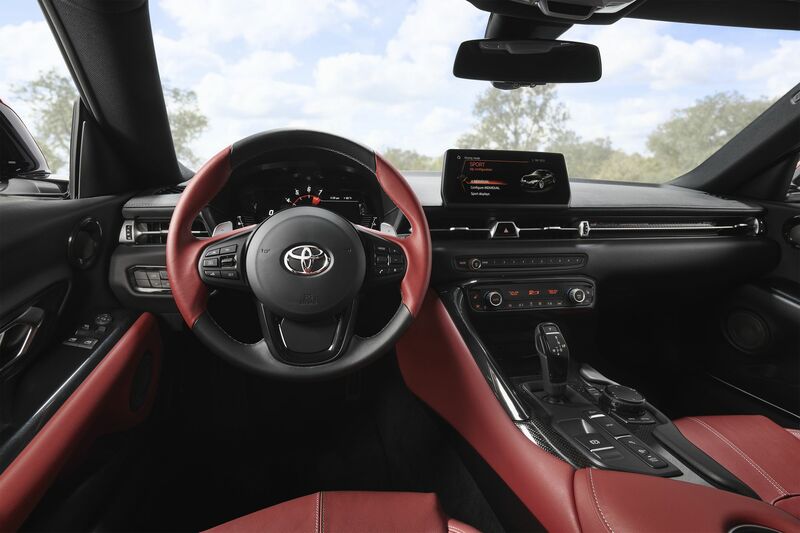 All get matte-black wheels, red mirror caps and carbon fiber accents in the cabin. 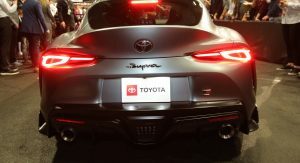 Unlike the Japanese market 2020 GR Supra that can be had with a 2.0-liter turbocharged four in two states of tune, in America, whatever trim or edition you choose, you’re “stuck” with the range-topping, BMW-sourced 3.0-liter straight-six turbo. 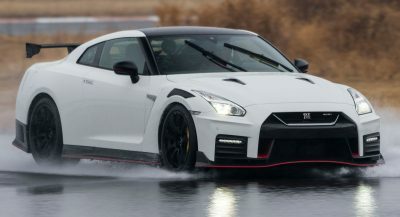 It’s rated at 335 hp and 365 lb-ft of torque paired to an 8-speed automatic transmission with paddle shifters. It will worth 20 mil in 30 years. I guess that’s a good investment. Really? Can you name any 1989 car worth 20 mil? Even Ferrari F40 or Porsche 959 are way cheaper! He’s saying it will be worth 10x the current price. $20 million, in today’s world, will likely be worth a lot less in thirty years (when a new Corolla might cost… venture to guess?). This new Supra certainly ain’t no Bugatti or Ferrari, though. Someone really paid $2M for a Z4? Both the GR Supra and the GT500 were sold for charity. It’s no way any indicator of their real value. I guess a supra built by BMW is worth a lot.. Yes we all know this,,it’s called sarcasm..
For that money you could of bought a Mint Acura NSX (New & Old), R32, R33, R34 & R35 GTR. Old Supra, RX- FD, some STI’s & Evos and still have money left over. ~ Or you could have 1 automatic bmw. Or you could’ve gotten something actually interesting…. I guess you have no idea what a charity auction is huh? Yeah, worth a lot… it’s finally an under-powered unreliable Z4 with 335i engine. Well it was for a special cause – the American Heart Association and Bob Woodruff Foundation – so it’s cool. Could’ve taken the LFA and call it a day. Don’t get me wrong, it’s cool. But not worth that much. Heck even the $50K is too much tbh. lol 😂 coz you know I’m right. Anything for charity is good with me. A GOOD CAUSE BUT IT’S STILL NASTY LOOKING. Like EVERY first car auction? Or are you just taking exception to the Supra? It amazes me how people who read this and miss the point of this auction – the value was not the car and some cool perks – it was to raise money for some good causes. Honestly, I cannot believe how entitled people are about this car. The A80 is all but ruined for me, now. You might get use to it? Maybe? Good cause stunts aside (it’s called marketing, not good causes), it won’t sell. 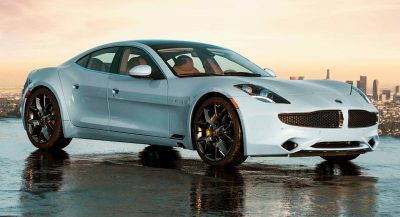 There are just too many reasons for it to become the next Mitsubishi Eclipse and more or less one step below the Nissan 370z in the automotive food chain. And those who will buy it will be mostly posers. They should also remove some components from the interiors. They smell BMW or German in general. A really pretty car, something about it makes me wish this had an Alfa Romeo grille and badge. I would also fancy a new 8C as well. This Car looks good, yes. But… I don’t like the story behind this Car, because this Car looks inside like a BMW and the fact is, that’s a BMW Z4 with a Toyota Batch. I’m the Owner from the BMW 550i, but if I see the Interior, that’s nothing like Toyota anymore. This Car did not deserve the name Supra! You should know that Toyota is paying for it to promote its own product. 2.1 mil is still cheaper than some video commercial and air time. gotta say I’ve liked the Z4 much better. Almost double the sale price of the first production 2020 Ford Mustang Shelby GT500 ffs. if it were me i’d just donate 1.95 Million and get myself a Z4 and call it a day. 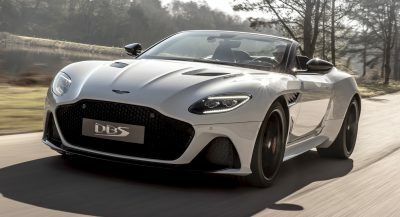 Next PostNext Could Genesis Be Working On A High-Performance G70 After All?